You know that special announcement I mentioned in the FGR earlier this morning? We were invited by Tim Miner of TrailSherpa.com to become members/contributors to his dream team of outdoor bloggers - Team Trail Sherpa. What is Trail Sherpa you might ask? Think "Facebook" just for outdoor types like you, our fans, and other lovers of the outdoors. It's a place where hikers, campers, backpackers, climbers, etc. can all get together to share ideas, stories, experiences, trails and more. Basically it's just a bunch of like minded people sharing our outdoors with each other. Now you might be asking what Team Trail Sherpa is all about. Well, Tim Miner had an idea, a dream if you will, to put together a solid team of outdoor bloggers that represent a wide array of outdoor experience from all over. 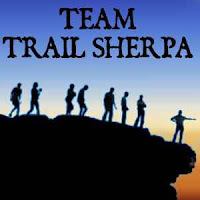 With that, he put together Team Trail Sherpa so that we could provide content to Trail Sherpa members and readers. Not just any old content though, but quality content including trail reports, gear reviews, recipes for the trail, etc. I won't go into anymore detail, you'll just have to drop in, become a member (it's free), and hangout. Other members of the team include Rebecca from Calipidder.com, Brian Green of Brian's Backpacking Blog, Tom Mangan from Two Heel Drive, Jeff Hester from SoCalHiker.net, John Roan from MountainUltraLight.com, Derek Loranger from 100peaks.com and of course our Lead Sherpa, Tim Miner of TrailSherpa.com. Be sure to check out these great blogs and look for future posts from the lot of us at Trail Sherpa. Also keep an eye out for new members of the team to be added in the near future and check out our Intro post on Trail Sherpa. P.S. We hit the 400 "Likes" mark on Facebook. Thank you to our fans for helping us reach that mark. Additionally, thank you to Headsweats and ENO for helping us out with our Celebration Giveaway of 300 "Likes".